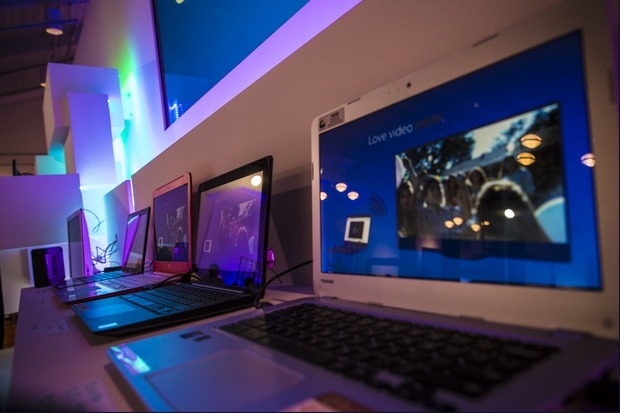 Last Fall, Intel and its OEM friends offered the world a total of four Chromebooks. However, the world’s biggest, most important chipmaker et al have announced their intention to multiply that by at least five — 20 Chromebooks available by year’s end. Nothing says, “Screw Microsoft,” quite like a Chromebook — no Windows, no Office and zero chance of ever running either. With that thought in mind comes the news that Intel and its OEM manufacturing partners are increasing their Chromebook offerings from four to 20. Moreover, the chip giant says it’s playing a leading role in the release of 64-bit Chrome OS. However, if you’re not confused by that, consider that these first Intel Celeron branded Chrome devices are based on the Intel Bay Trail-M system-on-chip. That is some seriously deep, deep, deep, um, marketing jargon. Chromebook: Fully Jargoned Desktops, Too! Intel et al are also taking another stab at the Chromebox concept, which is a desktop PC running Google’s Chrome OS operating system. In addition to Asus and Samsung, Intel is also partnering with Hewlett Packard and product is expected to ship in June. How serious is this latest Chrome on the desktop effort? HP will be offering models in black, white and, here’s the Apple killer, sky blue. Lastly, Intel and LG are expected to deliver a Chromebase all-in-one desktop PC. How, precisely, a Chromebase computer is different from a Chromebox or Chromebook computer is not clear.